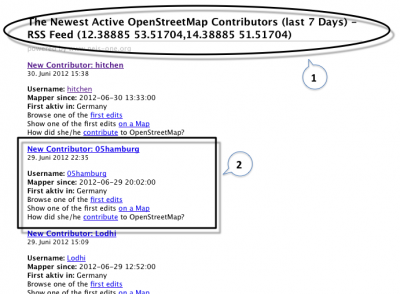 New OSM Contributor Feed : Neis One! The OpenStreetMap project keeps attracting more and more new members that register and start contributing their data to the project. In one of my last blog posts I presented a website which shows the location of each new and active member based on one of their first edits. Since the launch of this website, some of you asked me about a potential opportunity to feed this information for a particular area. Well, there you go! The “deg” parameter is used to specify the length (degrees) of your bbox. This means that with a “deg” value of 1, a distance of about 111km in each direction from your center point will be determined to create the bbox. This value of 1 degree also represents the maximum distance possible. The resulting Atom feed contains all new members of the past 7 days that made at least one change in you predefined area . Some additional information about each new member was added too . The database will be updated every morning between 6 and 7am CET. 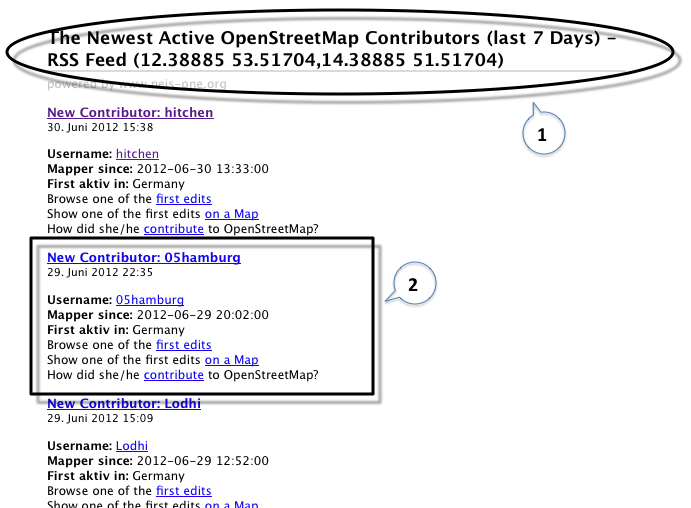 And another map to show which areas are controlled and whcich are not, http://openlayers.org/dev/examples/boxes.html. I’ve just seen the new features from http://opengeodata.org/weekly-osm-summary-48 and I have thought “This is exactly what I was looking for!” but I forgot that I suggested those features here 😀 Thank you! that’s a really cool tool. but is it possible to specify a bbox (ideally, a shape 😉 ) ? I couldn’t find this link anywhere on your blog, nor a way to select a country with a user interface. Seems like a handy RSS feed. I’m going to try using this to send welcome messages to new users as they pop-up in London. Do you share the code for this anywhere? I was noticing the feed content says “First aktiv in”. That should be spelt “Active”. I use it to get in touch with the new contributors in my areas of interest, to discuss about first modifications and propose some help, if required. For the first case, it allows to have a quick overview of the contributor’s interests and way of contribution, but also gives some time to get along with the various contribution tools. It is later on easier to contact the contributor with a personnal message, and allows to focus on the most motivated ones, where the chance for establishing a dialog is higher. Hi Fabien, thank you very much for your comment and your feedback. Overall I think it is not easy to integrate your second idea into that tool because I haven’t this information about how many changesets a new user have. IMHO I will just be informed if a new user starts next to me and it doesn’t matter if the new user has one or ten changesets. Do you know what I mean? Utterly awesome service. Many thanks for this. Been thinking about an email notification service using this. Does this sound sensible? I created a recipe to add a row to a Google Spreadsheat. Makes it easier for shared data management I think.